The menorah is most certainly an important symbol throughout the eight-day observance of Hanukkah. However, its centuries-old tradition does not mean your menorah has to be traditional. A nine-branched candelabra is the most common type of menorah, but there are lots of ways to make your own. You may opt to make a menorah if you need a kid-friendly option (i.e. minus the flames), you live in a dormitory where candles are prohibited, or you just want a more modern look. Whatever the reason, these DIY menorahs are simple to make, and the process of making one is a great way to honor the miracle of Hanukkah. This elegant menorah utilizes inexpensive pillar candles and candle holders found at a dollar store! To be kosher, a taller candle holder is used for the shamash candle in the middle. 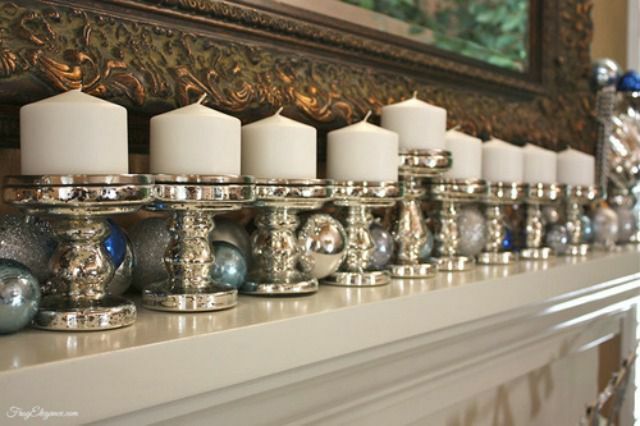 Lined up on a fireplace mantel, this DIY menorah is a beautiful focal point. An olive oil menorah is preferable to one that uses candles since the miracle of Hanukkah happened when one day's worth of oil lasted for eight. This simple yet beautiful menorah utilizes upcycled jars and bottles, and a tray. Another thrifty way to make a menorah is to save wine bottles, then spray paint them gold to use as candle holders. Although the shamash candle isn't visibly lower or higher than the other eight candles in this example, the menorah is positioned in a windowsill, which is a traditional spot to put one. These tiny salt and pepper shakers were filled with light-blue colored sand, which serves to anchor the candles. For this modern menorah, small tapers are inserted into the hole of square wooden beads, which can be painted or left plain. This colorful and kid-friendly menorah is crafted with painted wooden spools, small dowels for candles, and pencil erasers for flames. Small children will love "lighting" the candles of this DIY menorah. Who knew a trip to the hardware store could help you make a menorah! Copper plumbing parts glued to a platform make a simple, contemporary statement. Similarly, this menorah was made with hex nuts glued to a box, which conveniently stashes matches and extra candles. Dollar store vases are the foundation for this easy-to-make menorah. Simply fill them with aquarium rocks and anchor in some candles.